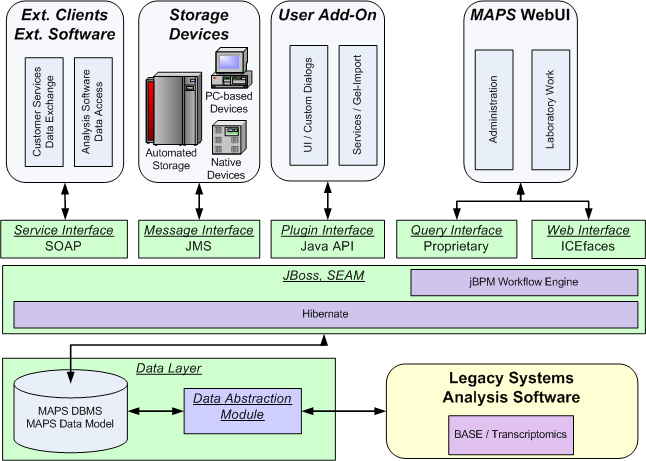 MAPS is a LIMS that was developed to be applicable in multiple fields of life sciences (like genomics, genetics, proteomics) and for various applications. It uses an innovative, flexible data model and comes with numerous technologies for adaptation, integration, and extension. In this way, MAPS especially meets the frequently changing requirements of R&D laboratories. MAPS can work with any Hibernate-supported DBMS at the data layer and has been used in routine applications with PostgreSQL 8.3. JBoss 4.2 and SEAM form the application layer, while JSF and ICEfaces are used at the presentation layer. All major current browsers are supported by the system.